Showers and a few thunderstorms likely. High 59F. Winds ENE at 5 to 10 mph. 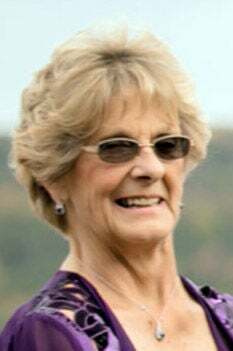 Chance of rain 100%..
WELLS, Vt. — Lynne Margaret Mason-Hayes, 75, passed away with her family by her side on Feb. 6, 2019 at her home in Wells. Lynne was born on Nov. 21, 1943 in Granville, the daughter of the late Kenneth Mason and Margaret Baker Roberts. She treasured her family and was known by her great-grandchildren as “Great,” and they really did no wrong in her eyes. Lynne was her family’s number one fan and always had their backs. She loved cross-stitching with Julie, gardening, feeding the birds and sitting with Phil and watching the various wild animals that showed up in their yard. Lynne is survived by her husband of 23 years, Phil Hayes, whom she married on April 6, 1996. Left to cherish her memory are her children, Greg Harrington (Bonnie), Valarie Woodruff (Frank), Lisa Martelle, Julie Greene (Bernie) and Jo-Lynne Bartholomew (Bart); and her stepchildren, Asa Hayes (Laurie), Dawn Meador (Lee), Becky Lanfear (Calvin), Holly Hayes and Stephanie Crossman. “Great” was blessed with 12 grandchildren, 11 great-grandchildren, eight step-grandchildren and six step-great-grandchildren. She is also survived by her siblings, Kenneth Mason and sisters, Luella Hawkins and Paula Parker. Left to miss her also is her faithful companion, Shadow. A funeral service will be held at 1 p.m. on Sunday, Feb. 10, at the Robert M King Funeral Home, 23 Church St., Granville. The family wishes to thank Bayada and Bob for making it possible for Lynne to spend her final days in her home. In lieu of flowers, memorial donations may be made to Bayada Home Care, 190 South Main St., Suite 2, Rutland, VT 05701, so that others may experience their wonderful care.